Welcome to Lonely Crane Landing! Welcome to luxury tent camping - ''Glamping'' - at Lonely Crane Landing! 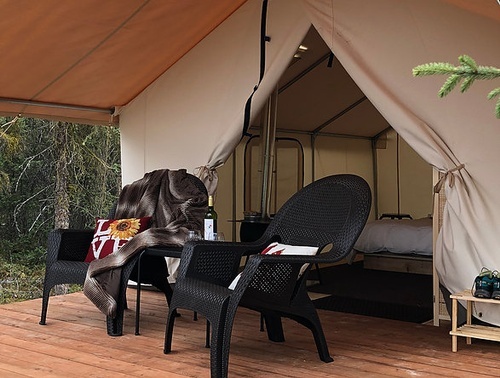 Camp in the comfort of your own 12'x14' private tent complete with a king size bed, Egyptian cotton sheets, down comforter and a wood stove for the chilly evenings. Enjoy the sights and sounds of Alaska including Sandhill Cranes, moose, eagles, loons and the occasional bear from your covered deck, and take time to wake up on your first morning with breakfast delivered to your tent. ?Most importantly before you book, remember, this is camping - in a more luxurious way than “roughing it” - but it’s still camping. Lonely Crane Landing has two tent sites (booking is done separately for each) overlooking an amazing wetland and pond that is home to Sandhill Cranes. 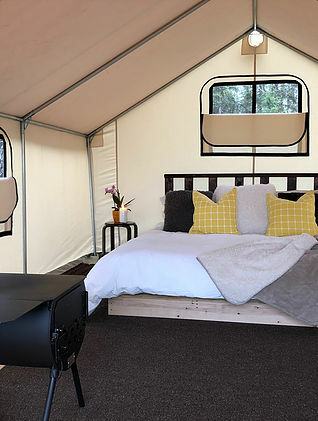 Each tent has cozy amenities like velvety soft cotton bedding, down comforters, a wood stove and a private covered deck. There is a camp toilet and a sink, but the bathroom set up in each tent is relatively simple. As a guest, you will have access to indoor plumbing (including showers) at designated times in the morning and evening at the house. The tent bathroom is for your convenience, but please realize that it is a camp bathroom in your tent. The location is just outside of Soldotna - getting to town is about a 10 minute drive. I live in the house on the property with my two dogs, and the surrounding area, while near a neighborhood, feels like miles from anyone! There are numerous paths for walking and exploring just outside of your tent door, and plenty of wildlife viewing opportunities, including moose.